Kentucky pork farmers’ commitment to ethical practices and continuous improvement is stronger than ever. Healthy pigs equals a safe food supply. Biosecurity, close monitoring, vaccinations and barn maintenance are all important to herd health. Programs such as Pork Quality Assurance Plus® teach best practices in this area, ensuring farmers and their employees are well trained and knowledgeable. 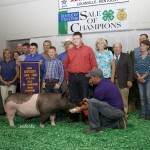 For many years, the Kentucky Pork Producers have supported the activities of Kentucky youth. From youth swine shows to supporting pork based classroom curriculum, the Kentucky Pork Producers takes an active role in shaping the next generation of farmers and pork lovers. 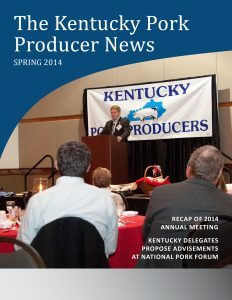 Keep up with the latest news from the Kentucky Pork Producers Association through our newsletter. View the current issue and archives. An easy way to marinate your pork chops. Serve with Sliced Tomatoes Vinaigrette, broccoli spears and Garlic Mashed Potatoes.